Two Indiana State University professors are out with a new guidebook for nonprofit leaders that promotes campus and community partnerships for addressing many of the challenges their organizations face. “Cooperate-Advancing your nonprofit organization’s mission through college & community partnerships” was authored and edited by Nathan Schaumleffel, associate professor of kinesiology, recreation, and sport and campus/executive director of the Nonprofit Leadership Alliance Certification Program, and Tina Kruger, assistant professor of applied health sciences, in league with Indiana Campus Compact and its faculty fellows program. While there may be a pre-existing plethora of nonprofit how-tos, this guide focuses on opportunities that potentially arise when nonprofits and colleges work together, Schaumleffel said. In order to get the most out of a college-nonprofit partnership, Schaumleffel stressed, all parties must have their needs met. When the goals of a nonprofit and a university overlap, that can mean low-cost or free resources to the nonprofit, experiential learning opportunities for students that achieve learning outcomes, and achievement of academic objectives and professional development goals of professors. The guide also spares readers tedious re-information by specializing its focus on executive directors, board members, volunteers, and staff who are already well-aware of the fundamentals of nonprofit leadership. Written by nonprofit leaders, it pays great attention to the obstacles that hit small- to medium-sized nonprofits especially hard-such as fundraising and volunteer management. The foreword of the 153-page book was written by Nonprofit Leadership Alliance president emeritus Michael Cruz and current president Susan Schmidt. The book was published by Indiana Campus Compact and co-authored by other faculty fellows from DePauw University, Indiana University-Purdue University Indianapolis, Purdue University-Calumet, and the University of Indianapolis as part of a 2 ½-year engaged scholarship initiative. “Engaged scholarship… [combines] faculty roles of teaching, research, and service,” according to the New England Resource Center of Higher Education. 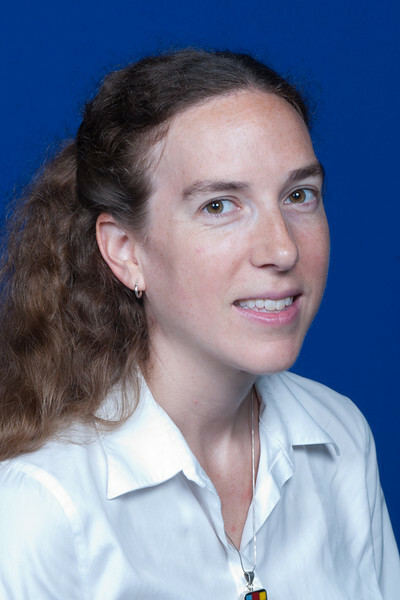 Since many contributors had one-year fellowships, it was Schaumleffel’s responsibility as Senior Faculty Fellow and editor to manage the project from conception to publication, as well as provide content. While Schaumleffel lead-authored all but one of the chapters, he credited Kruger for her enormous contributions to the project, acting as lead-author on one chapter and co-author on another. 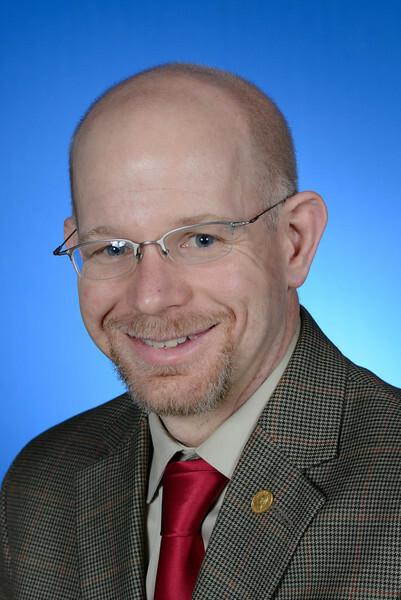 Kruger is director of the gerontology certificate program at Indiana State. 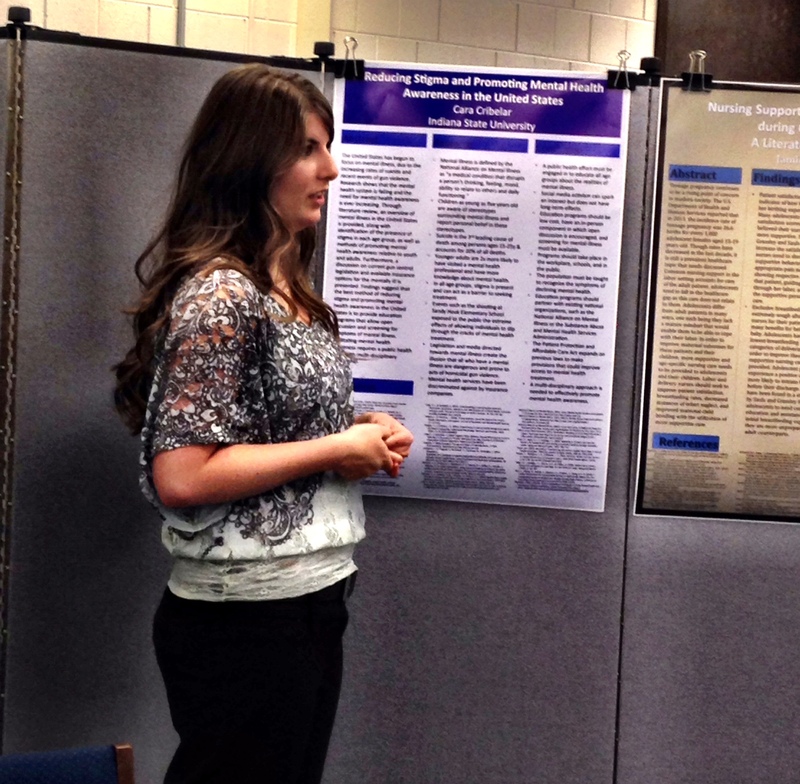 She uses her knowledge of gerontology to benefit her students and community, as well as make an international impact. 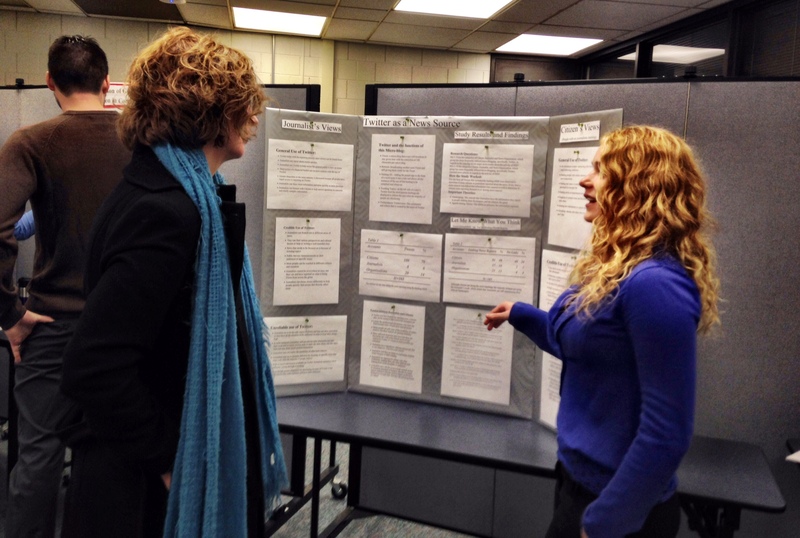 For her individual project as a Faculty Fellow for 2012-13, Kruger oversaw students in her health promotion aging class while they surveyed older attendees at Dine with a Doc. Visiting two locations in Vigo County, the students asked participants about the topics that concerned them most, focusing on the ways Senior Education Ministries-the sponsor of the event-could provide them with a better quality service. 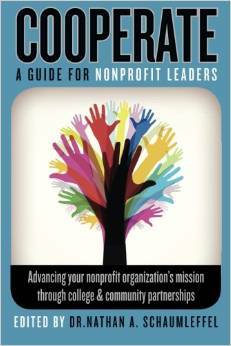 The project was highlighted in Chapter One of “Cooperate” to illustrate a successful college-nonprofit organization partnership. During the summer of 2014, Kruger also took an international community engagement and service-learning trip to Finland where she and others looked into nursing homes and senior healthcare abroad, and other issues that are important in the field of gerontology. Indiana Campus Compact supports higher education’s efforts to help students become active and informed citizens through service-learning and community engagement. The only statewide higher education association dedicated specifically to campus-based civic engagement, it includes public, private, two-year, and four-year learning institutions. 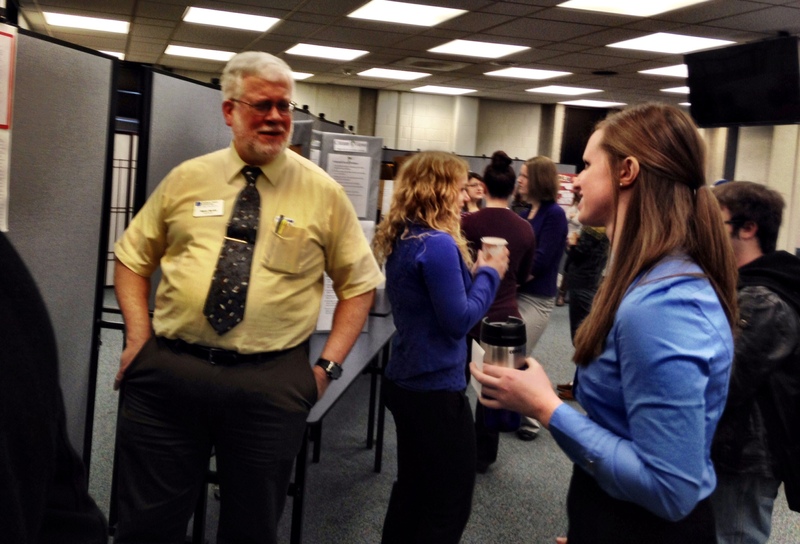 It also offers scholarships to faculty and students with similar project goals. Since the funds from previous Faculty Fellow class projects helped seed “Cooperate”, Schaumleffel said that any profits from the book will return to the Indiana Campus Compact Faculty Fellows program for future projects. The book can be purchased on Amazon at http://amzn.com/0692296190 and is available in both paperback and Kindle e-book format. Tuesday December 9 thru Thursday December 11, the Alumni Association will be in the lobby, passing out snacks to the students. Do your friends always ask you to read their papers? 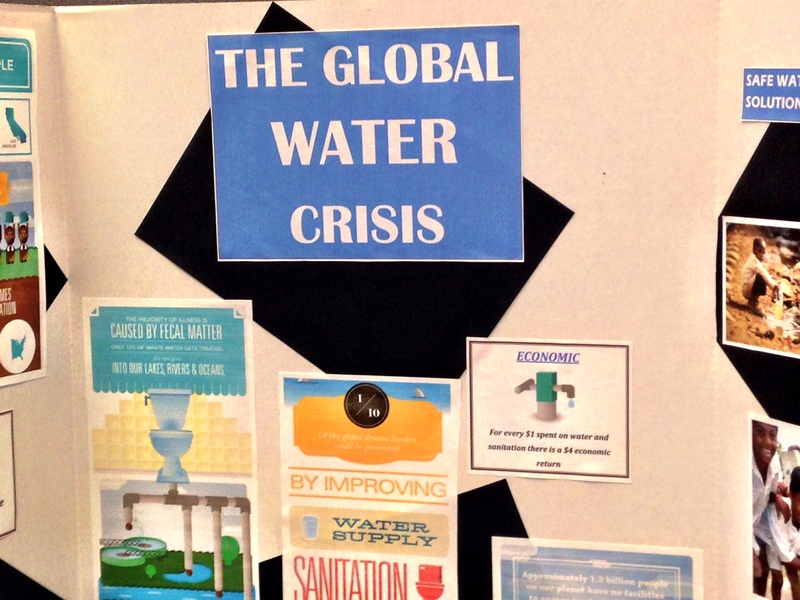 Do you have a knack for figuring out that problem that no one else in your class can solve? 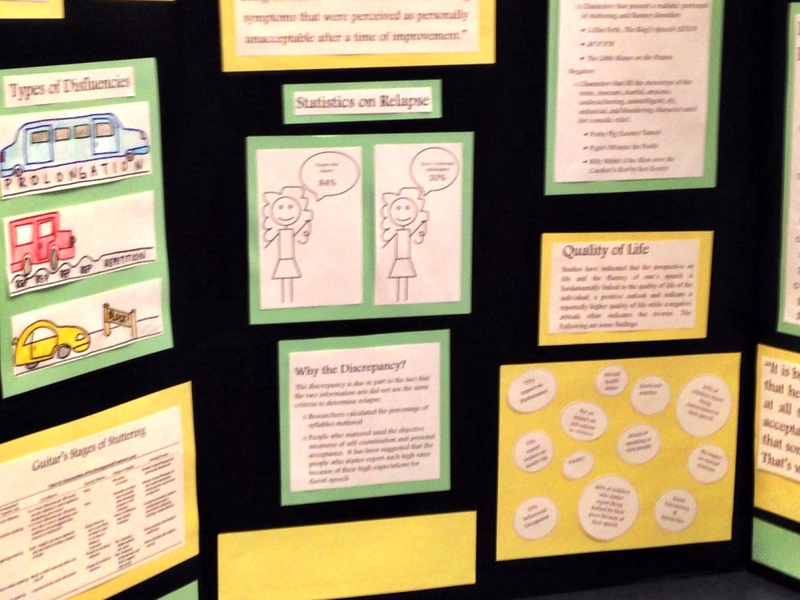 You might make a great math or writing consultant! 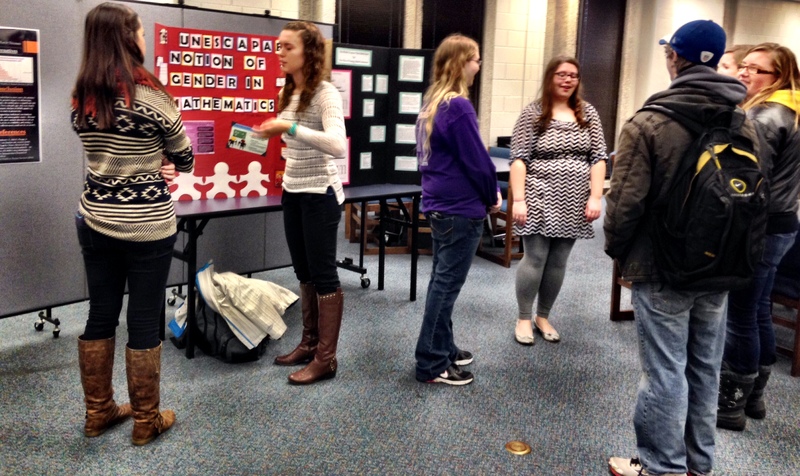 The Math & Writing Center is seeking upperclassmen with at least a 3.0 GPA to begin tutoring this spring. 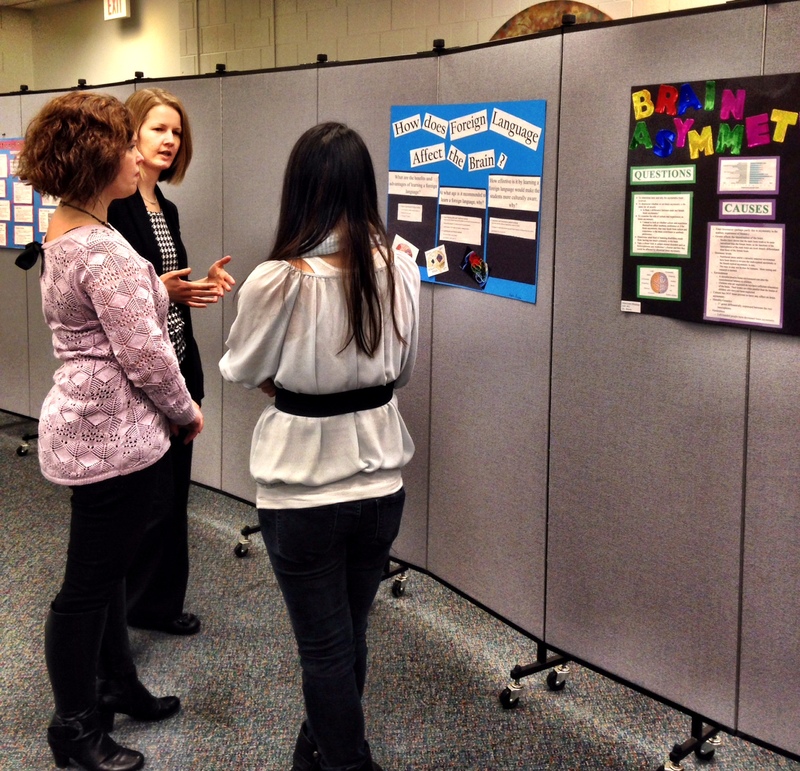 Apply for either Math Consultant or Writing Center through the student employment website. Be sure to include your undergraduate transcript, a cover letter, and your resume. 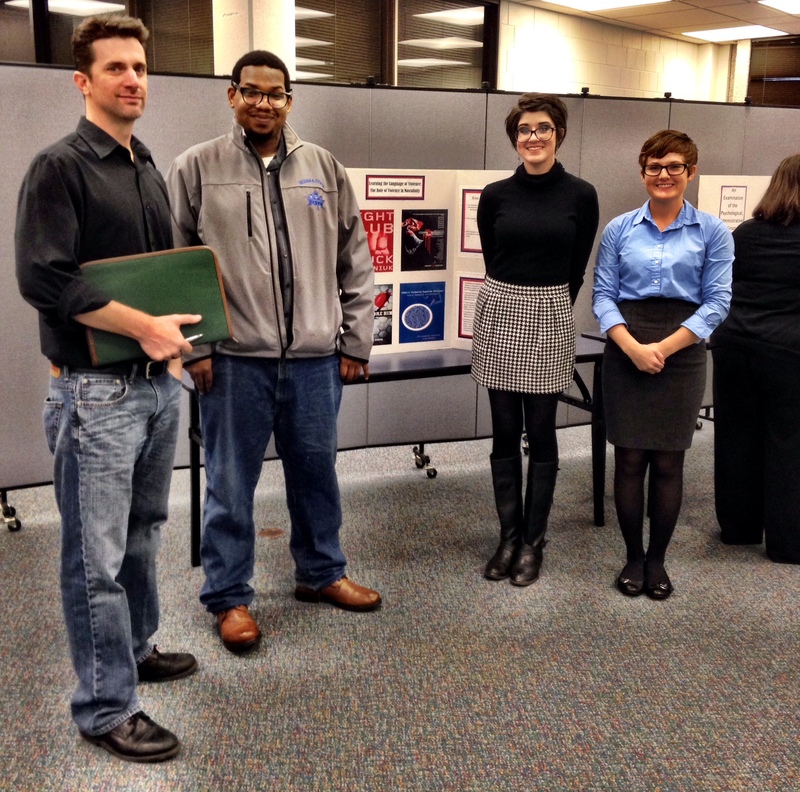 If you are applying to tutor writing, please attach a research writing sample. If you have any questions, please email Nicole.Bailey@indstate.edu or call 812-237-2989. Student Health Promotion will be giving away free pillows to students with an ISU ID. 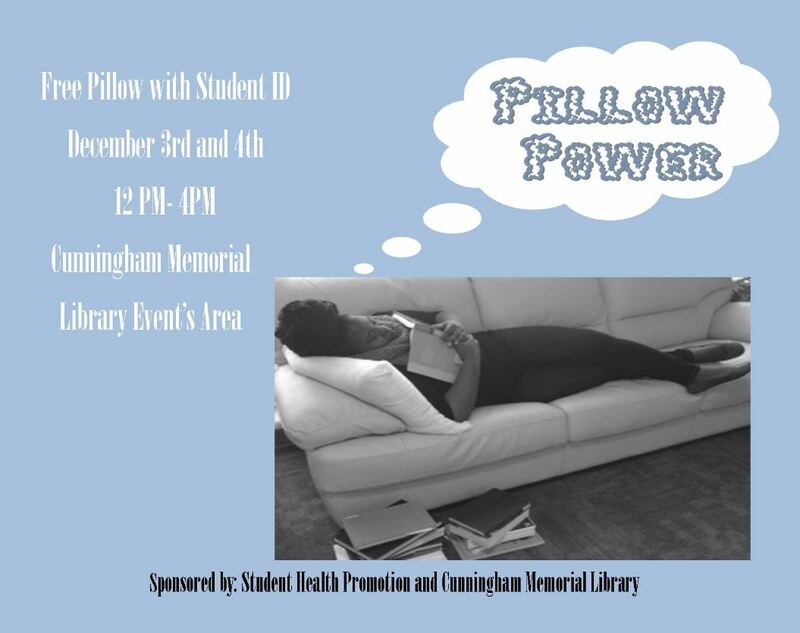 Visit us in the Cunningham Memorial Library Events Area on Dec. 3 and 4 from noon to 4 p.m. and receive a fresh, new pillow! 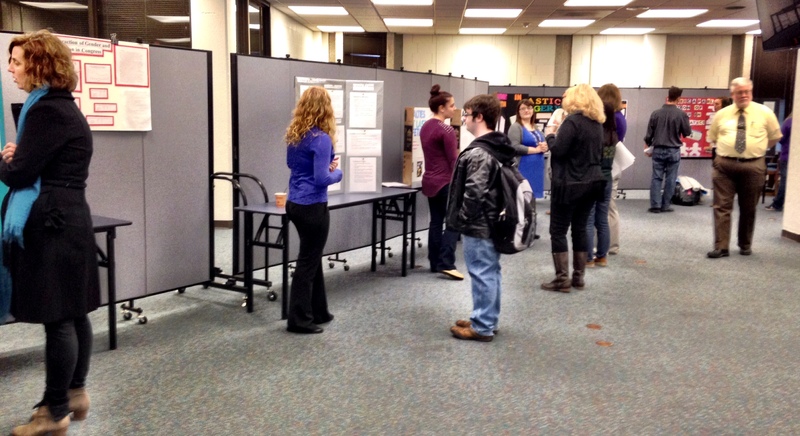 Honors Program will be having their General Honors 401 Poster Sessions today and tomorrow, in the Library Events Area. Each day will be split into 2 sessions. The morning session is from 10 am – noon and the afternoon session will run from 1 pm – 3 pm, each day. Each session will have different students’ work. Hydie Aroune, Biology: How does foreign language affect the brain? 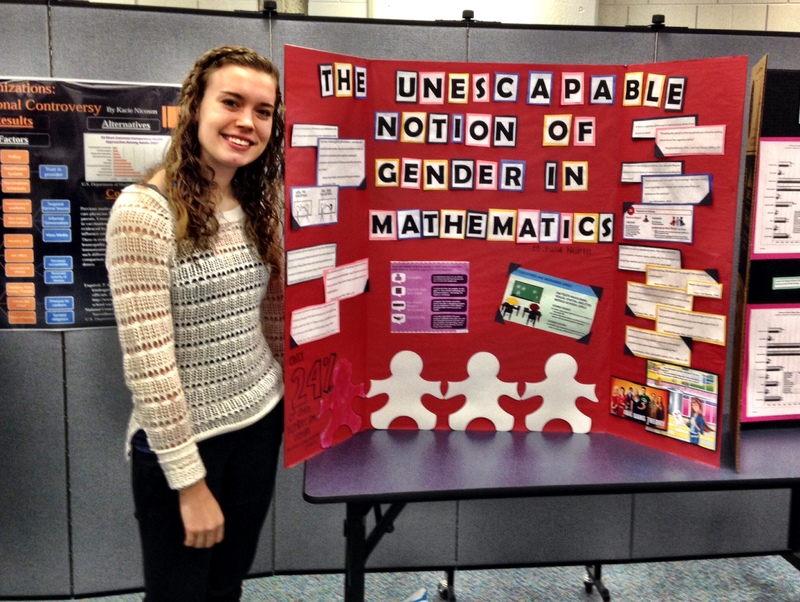 Devon Jacobs, Elementary Education: Why do college students join Greek life? 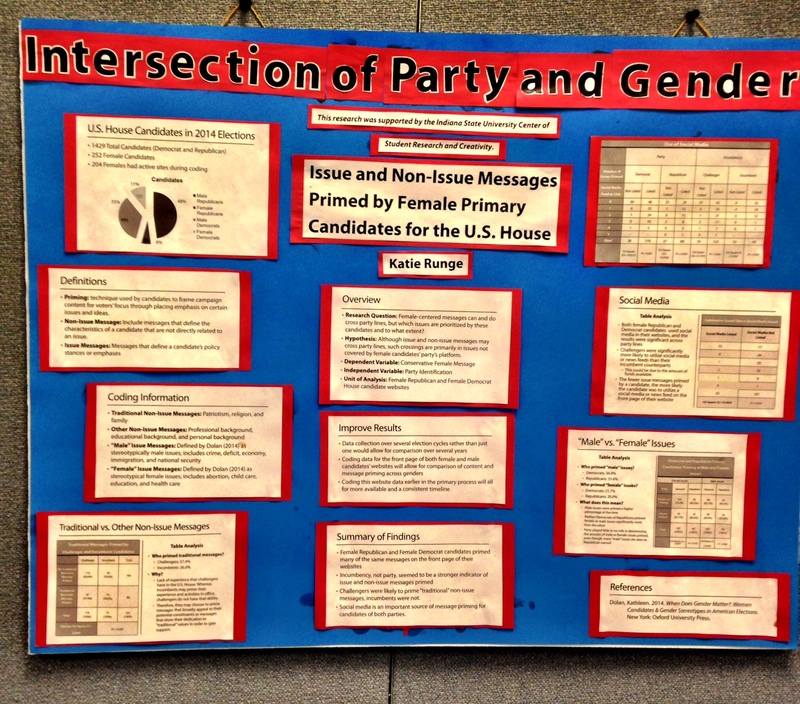 Abbey Rogers, Political Science: Are college-aged students politically socialized by their former high school’s demographics?